Heels over Head has big dreams, dreams of being recognized with a SAMA award, dreams of getting acknowledged in countries outside of South Africa. Heels over Head believes these dreams don’t have to be just dreams, but there is opportunity to grow out to be a well-known jazz band, an example for others. “Their particular brand of smooth jazz, cunningly combines contemporary African musical phrases, evocative popular African standards, dance inducing rhythms and happy melodic vocals. 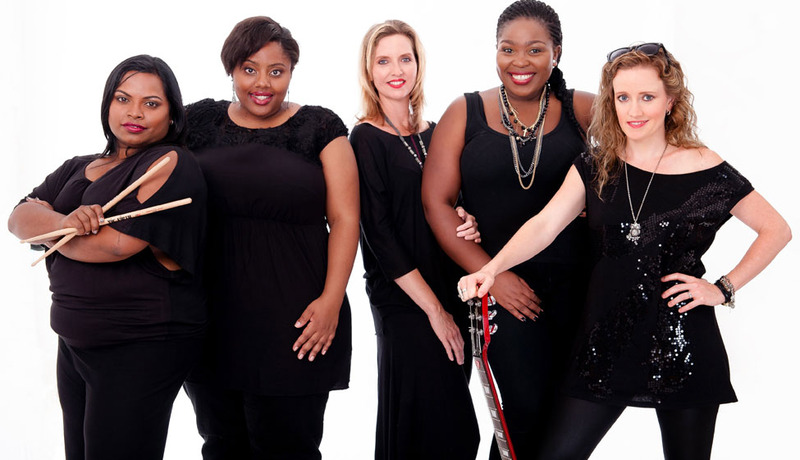 Dressed to kill, they present well, combining glamour and warmth with a hint of the seductive; obviously a hot combo!” Gisele Turner – Going Places SA Heels over Head is an all-female jazz band from the shores of Durban, South-Africa. The love of jazz music weaved these girls together towards to end of 2008 to form this unique musical force. Since then the girls are always occupied with composing, rehearsing and recording new music and with lots of performances around KwaZulu Natal and the country. Their music is referred to as smooth jazz or easy-breezy pop jazz, they developed a notable and clever signature sound that consists of current African-influenced music and uniquely re-arranged standards. The band is known for making the audience get on their feet and dance to their rhythmic bass lines and their cheerful melodies. With their sparkling stage presence the ladies always look classy and stylish and you cannot miss the charm and charisma of their lead vocalists Thulile Zama and Nomkhosi Mazibuko. They are joined by skilled drummer Rebekah Pillay and accomplished pianist Mandy Cobbing. Last but not least smoking hot guitarist Chillie Stent joins the band and the flaming fusion of musicians is complete. No doubt that fans take joy in listening to some Heels over Head; the African jazz ambiance, skilled musicians and vocalists and well-founded rhythm works enchanting. Winner of Yamaha Young Talent Award 2010 2010 Debut album titled: Could It Be Nominated for MTN SAMA AWARDS 17 Contemporary Jazz -2011 2013 EP titled: Sondela Needless to say the sound of the band has grown tremendously in terms of dynamics, arrangements, compositions and performance while still staying true to all their original fans. The band now has found its groove and is steadily paving its red carpet on the music scene by creating a watertight sound that can be enjoyed by all who experience their music. Together these ladies have tremendous experience locally, nationally and internationally. Their performance skills have won them respect and a number of fans wherever they perform. Songs like "All the things you are", "Could it be" and “Njabulo” are just 3 of the many songs performed by these ladies that get the crowd off their seats. Other favorites that will keep you humming are "Love Song", "Inyandza leyo" and "You Are Everything". Recently they performed at the prestigious Chief Albert Luthuli ICC, Exhibition centre, Zimbali Lodge, Hazelmere Jazz Festival, Howard College Theatre, Centre for Jazz and Popular Music at UKZN, Bat Centre, Rivets Bar/Hilton Hotel, The Durban July just to name a few. Also outside of Durban the ladies are starting to make a mark, with recent performances at The Bassline, Moshito, The State Theatre and Carnival City in Johannesburg, the South African Jazz Education Conference in Cape Town, Mamelodi/Pretoria, Drakensberg and a two mini-tours in Swaziland. Members have shared stages with great musicians including the likes of Abdullah Ibrahim, Hugh Masekela, Sbongile Khumalo, Busi Mhlongo, R.J. Benjamin, Ringo Madlingozi and dub poet Linton Kwezi Johns. “The girls” as they are affectionately known, have been featured in various bands and ensembles that have featured on our local TV programs such as Weekend Live, Top Billing, Selimatunzi, Yo TV , Sistahood and Go Zone. Besides this they have had two exclusive performances on Morning Live. The attention from the media has been caught, with articles in several newspapers, such as The Mercury, Mail Guardian, Daily News, City Press, Ilanga News Paper, uMafrika and Isolezwe, frequently feature the girls for performances, interviews and reviews Also the radio pays attention to the band, their music and interviews frequently appears on local radio stations and national radio stations such as SA FM, Radio 2000, uKhozi FM, Metro FM and Gagasi 99.5 Tracks from the album and EP are playlisted on: Gagasi FM 99.5, uKhozi FM, Ligwalagwala FM, Phalaphala FM, East Coast Radio and Khaya FM. Heels over Head released their album “Could It Be” in November 2010 during a sold-out launch at the Hilton Hotel and their EP “Njabulo” in November 2013 at a sold out KZNSA Gallery. We can safely say the band has made their mark in the KZN music scene with their fresh sound and are a "house-hold brand". Heels over Head to explore plenty outside of KZN: Johannesburg, Cape Town and other places within South Africa. In 2011 was also the year they released their music videos for “All The Things” and “Girlfriend” featuring rap artist Abdus. Currently the band is working on new compositions.